After seeing the Foundry tweeted a tutorial on converting a 2D image of fire into a stereo image today, I wondered if you could use a similar method to generate stereo noise clouds within nuke. Here’s a script I knocked up this evening very quickly to demonstrate the idea, please feel free to expand and improve on this! Set your new project to have stereo views (in the Project Settings). Make a Noise node. By default it generates a nice cloudy texture. 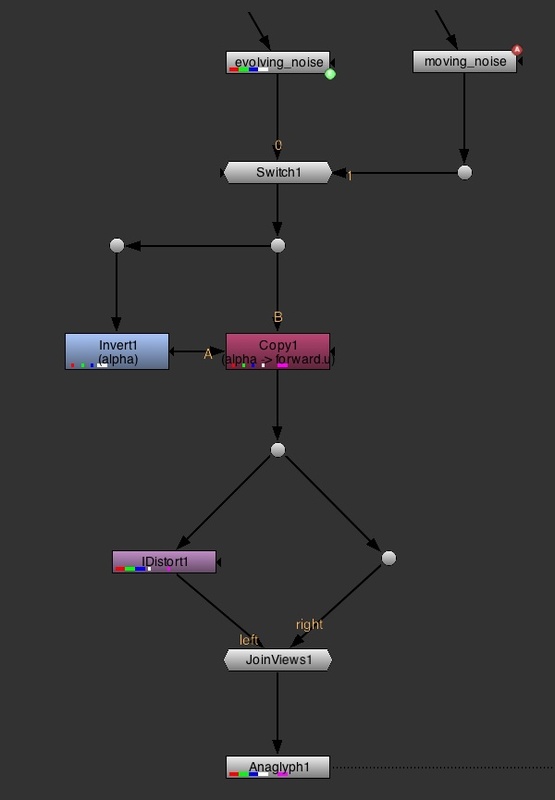 Make an iDistort node, set the channels to RGB, the UV channels to motion (and just check the u box), set the UV scale to 15 or so. Stick an Anaglyph node under that and put on your red/cyan glasses to view your noise cloud in wonderful stereo. This uses the motion channel values to distort the image horizontally; the black (0) areas have no effect, and the white (1) areas distort fully, and all shades in between. So that has the effect of pushing the white ‘peaks’ to the left, while keeping the black ‘valleys’ where they are. Giving the illusion of depth when viewed in stereo. It’s not really like smoke, because you can’t see the other side, but perhaps a combination of several of these could simulate it better? Suggestions welcome. If the noise isn’t animating, and you use the translate tab to move the noise around, you get the illusion of looking down onto a bumpy landscape with peaks and valleys. Could be useful. Will play with this more, it may not be of much use but feels like there’s potential there for generating stereo elements to put onto stereo live action (if you can’t get hold of real elements, of course).